Melita's Coast of Britain Walk – What on earth have I got in my rucksack? monument stone at the top, dedicated to Gwent Jones (1910 – 1962) and Stephen Lee (1889 – 1962), described as ‘Dau gyfaill gwyr’ – two faithful men, who, as members of the Gower Society, helped preserve the cliffs. Their work was well done – the cliff top walk is fine walking. We were pleased to see some ponies enjoying the view, too. The tide was out, showing how the cliffs have developed over millennia, rock thrusting up from the earth’s core, and being worn away by the constant pressure of the waves. There are no trees on this stretch of path, nothing but gorse. Although we have had rain the last couple of days, the grass is yellow and worn. Around 10.15, the clouds began to clear. We were in hopes of finding a cliff-top café for coffee, but, once again, were disappointed. The path winds in and out of the deep fissures in the cliff face – running inland for a few hundred yards, down and up a steep slope then out again towards the sea. We were looking out for the famous Worm’s Head, but were not quite sure we had found it, until we passed it and looked back, then the shape of it is easy to sea. Nothing to do with worms, of course – ‘worm’ is a mediaeval term for a dragon. The cliff tops were easy walking, and we soon began to see lots of other people with children and dogs. Passing the Worm’s Head, we could see the curve of bay that is the delightful Rhossili beach – voted Wales’ best beach this year (2018) by Trip Advisor, and apparently in their top ten for the last six years. And it is, indeed, spectacular – probably the best beach I have encountered so far in the whole walk. Some of the Norfolk beaches might run it close for length and beauty of sands, but with the cliffs and the scenery round Rhossili also being magnificent, it is in a class of its own. On a more prosaic note, there is also a fine café, where we had a super lunch, overlooking the sea. To reach the beach, you need to go down a winding path and then steps. The sun was getting stronger, and the sky bluer – ideal conditions. The beach itself is completely flat – the sands are soft and pale gold, and the water was warm- we took off our boots and walked through it – very welcome to the feet after several days walking. The size and quantity of jellyfish was less pleasing. As we walked north (the bay is at the end of the peninsula, and turns north), we could see lots of para-skateboarders. Not sure that is the right name – they have skateboard type things, with sails, racing along the sands. Some of them went so fast they took off and it looked great fun – shame I am too much of a wimp to give it a go. The path climbs up the cliffs, to a hillier section. On this stretch, there is no beach – the rounded green hills just drop straight into the sea, and you can see across the estuary of the Llwchwr into the county of Carmarthen. We then curved round and down into some sand dunes, and the path meandered down to the beach at Llanmadoc The beach went for miles, extending into an area called Whiteford Sands along a spit, and, for me, was quite as impressive as Rhossili. We kept thinking we must have reached the end, but the beach curved on and on for nearly four miles. At the northern-most tip, it swung back on itself and the path went inland. To our left was a vast expanse of wetlands and marsh. To our right, a strip of woodland, Whitford Barrows, only a few hundred yards wide, but completely different scenery from the beach on the other side. 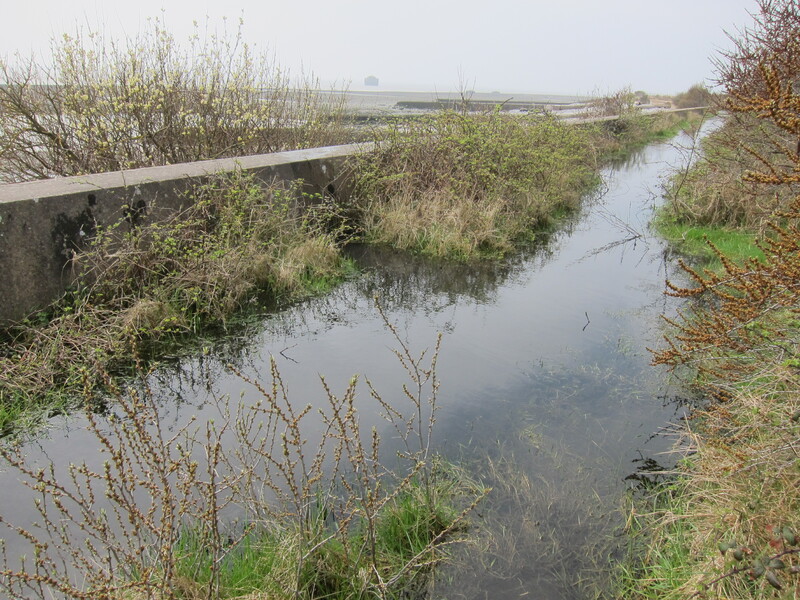 It used to be possible to cross the wetlands on a mediaeval sea wall at Cwm Ivy, but the wall was breached earlier this year, and has not been repaired. We therefore had to join the road and walk a mile or so along it, back to the pub, where I also picked up some good news about another project. Unsurprisingly, with the views, the company and the weather, this was a diamond day – only my second. 18 miles. What a difference from yesterday in the weather! When we started out, it was grey and mizzling and continued overcast until well on into the afternoon. We drov e down into Gower, and left one car at Port Eynon, before coming back to Caswell Bay. We dropped down on to Pwll du beach – being very critical of the rather ugly 1960s block of flats that over shadows it. Walking to the end of the beach, it was not clear where the path went – either over a heap of rocks at the end or else up onto the road in front of the block. Whilst we were deliberating, we saw a couple of brave swimmers – it was still wet and quite chilly, and we were thinking that swimming was the last thing we fancied – suddenly, the man called out – Nick! Astonishingly, the couple had been my sister and brother-in-law’s neighbours in Surrey back in the early 2000s. Talk about a coincidence. Just proves you cannot go anywhere without running into someone you know. We chatted for a moment, and asked about any cafes in the vicinity – coffee was feeling like a good plan. Unfortunately, the nearest was an hour away at West Cliff. We arrived at the excellent café in pouring rain, so spent a good 45 minutes having a delicious Welsh rarebit and coffee. It was still drizzling as we emerged but we were slightly comforted with the thought that the latest weather forecast was for sun in the afternoon. Back on the path, we went round the headland, and found ourselves overlooking Three Cliffs Bay. The path then deviates into Pennard Burrows – as one might guess from the name, this is a series of sand-dunes – not brilliant for walking in, and easy to lose the path, but, with the general lay of the land, not possible to get lost, even though you have to go slightly inland, towards a ruined church, as there is only one place to cross the little stream – a series of stepping stones. There were quite a few people about by this time, with dogs and children as the rain had stopped. Over the stream, and up onto a low headland, than down through woodland with dunes under foot, onto Oxwich Bay. We met a boy of around 12, who was holidaying with his family, who was eager to tell us about the giant blue jelly-fish he had found. It was the largest one he had ever seen – it was even the largest one his dad had ever seen! 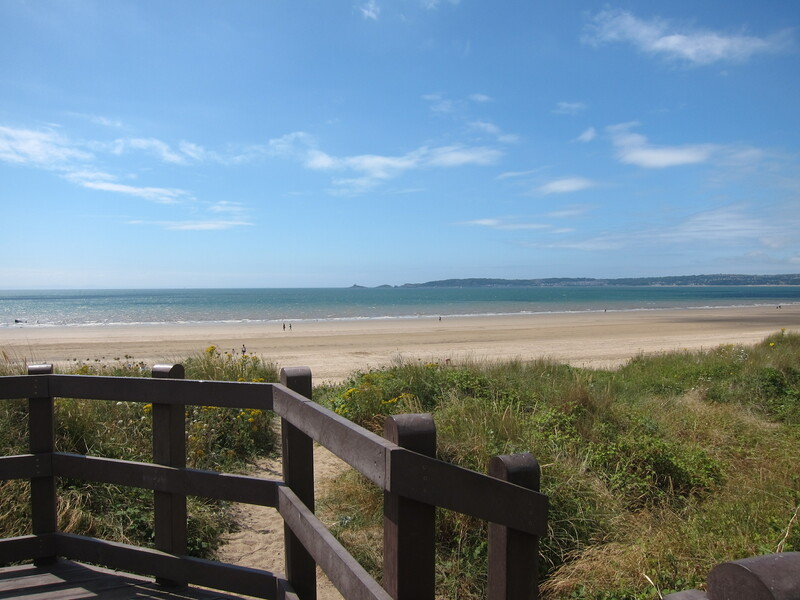 And when we came onto Oxwich beach, we could agree that the jelly-fish are monsters! We stopped for a drink at the hotel at the end of the bay, then went through the woods at the west end of Oxwich – there is a little church hidden in the woods, dedicated to St Illtyd. Legend has it that the first Christian church was built here in the sixth century – the current building is ancient enough – 13th & 14th century. Unfortunately, it was locked. There was a steep pull up to the top of the cliff, but the sun was beginning to shine quite brightly and the views were excellent as we did the last few miles along the beach edge before arriving at Port Eynon. There were lots of ponies wandering about – presumably they wander on the common land like Esmmoor ponies. We found a pub, and had a welcome gin and tonic. The pub was crowded, and lots of people were eating. However, the presence of a (used) nappy in its sack on the table next to us argued in favour of a home-cooked meal. A silver day, with 13 miles covered. Today was quite a contrast to yesterday! I left the rather lovely Air B and B I have booked, with the idea of leaving the car about halfway between Abertawe and Mumbles. Nick, my brother-in-law from Australia, was due to meet me mid-afternoon, so the plan was to walk half-way, then meet him back at the house and continue. I duly parked, and waited for a bus. And waited. And waited. According to the timetable, they passed along the road every half hour, and I saw two come along, and turn up the road just before the stop I was standing at. I wrestled with downloading the timetable again on my phone and concluded that the bus I wanted did not run on a Sunday (atlhough the whole site was rather vague on detail), so I drove into Abertawe and parked by the station again. A good hour wasted! But it did not matter – the weather was warm, and although I was feeling somewhat battered about the legs after yesterday, I was in good spirits. I walked down through the shopping area of Abertawe, past the ruins of the Norman castle, and into the bay area. This has been renovated in recent years and is a rather lovely marina. There were hordes of people around, apparently a charity run is in progress. I fought my way against the tide of runners, and along the marina, coming out onto a short passage of sand-dunes, before the beach. It is a superb beach – I am amazed it is not a more popular holiday destination. The sands are flat and golden, with a long tidal range. I walked steadily for a couple of hours, soothing my scratched legs in the clear water, before climbing back up onto the cob and finding a bus that was actually going to Swansea. I picked up the car, and went back to the house, where I met Nick. After a swift lunch, we dropped one car off at Caswell Bay, just beyond Mumbles and took the other back to where I had caught the bus. Proceedings got off to a good start with an ice-cream from the local dairy. 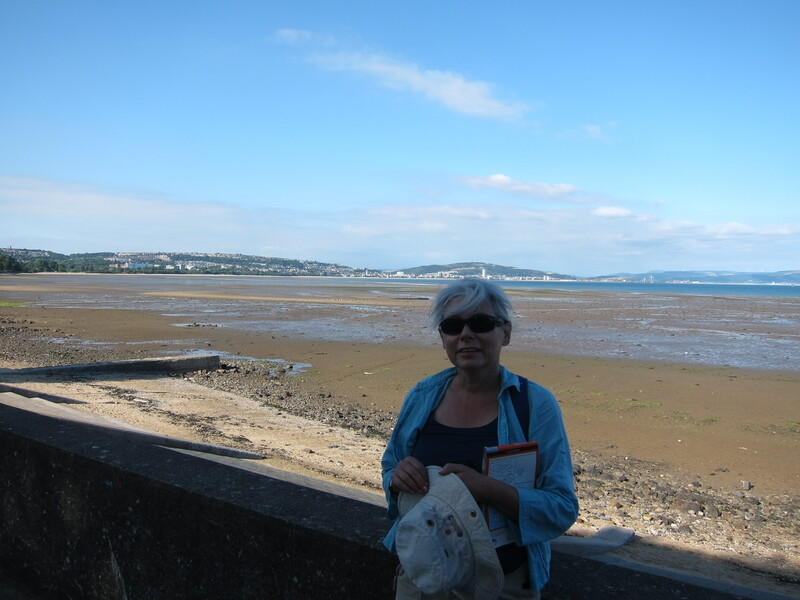 Again, it was a leisurely walk – the beach at this western end of the bay is much less attractive – quite a lot of rather smelly mud, so we walked mainly along the promenade, into Mumbles. We could see the lighthouse on a promontory, off the beach below – there were steep stairs going down, then up again to the lighthouse rock, but much of it was inaccessible. The lighthouse was built in 1794, and re-engineered in 2017 to be LED lit. The other famous feature is the pier, with the station from the old Swansea-Mumbles railway – the first railway in the world that took paying passengers. At that time it was horse-drawn, but converted to steam-power in 1877. 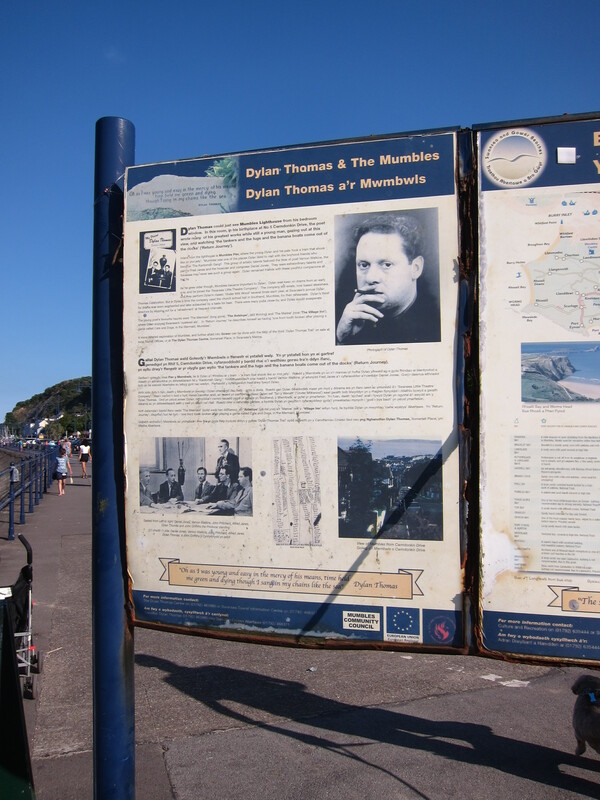 Always a popular holiday destination, Mumbles was described by Dylan Thomas as ‘a rather nice village, despite its name’. 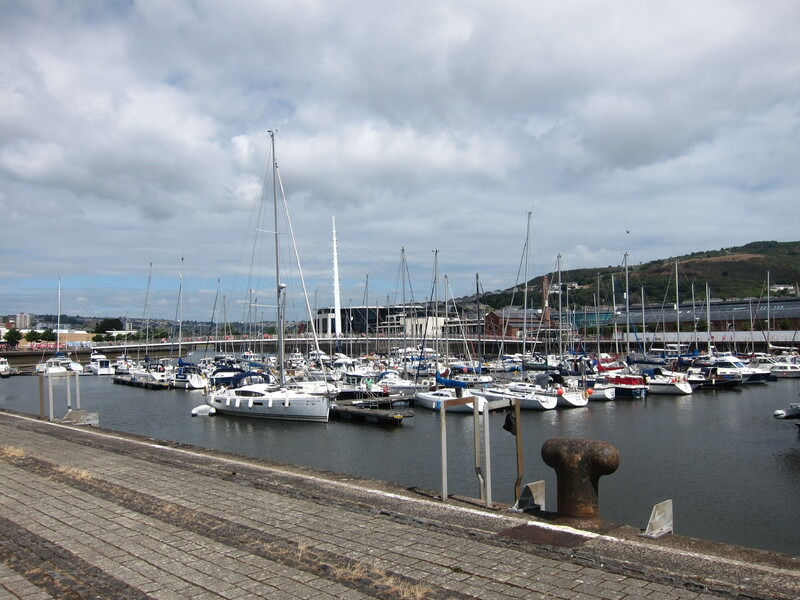 The town was chosen by The Times newspaper as the best place to live in Wales in 2018 – personally, I preferred the beach at the Swansea end of the bay, but it is certainly a charming town. The path then climbs up onto a headland, over the golf course and in the late evening sun we could see far away to the headland above Oxwich. A thoroughly enjoyable day – actually reaching Gold standard. I thought today would be long, but fairly easy, and not especially exciting, since it involved walking through the industrial areas around Neath – Porth Talbot. Well, it was certainly long! Pleasingly, public transport posed no problems – once I had worked out how to use the ticket machine in the car park for Swansea station. A queue began to form behind me as I wrestled with the machine that insisted on either charging for two days, or refusing to recognise my card. I apologised to the waiting commuters behind me, but people round yur are very patient. Had I been in the south east, there would have been a good deal of harrumphing. Train to Pyle, then bus to Cynffig. En route between the train station and the bus stop, I was delighted to see the coach for the Bridgend Male Voice Choir, and a selection of its smartly dressed members. Sadly, they did not break out into Bread of Heaven – in fact, they were nipping into Asda for the all day breakfast! As I waited for the bus I began talking to an elderly lady. Her hair, I noticed, was a thick plait down her back, reaching her waist. It was only when I stood behind her that I realised it was doubled up. Loose, her hair must have reached mid-thigh. I wonder if she has ever cut it. The route back through the dunes was easy enough. I chose a flatter path than I had used to come the other way, earlier in the year, so it was a bit quicker. I was then on the beach and what a splendid beach it is. I took off my boots and walked along ok the sea edge. Glorious, the sun shining and the Devon shore clearly visible. Inland again, then a rather confusing path around the edge of the steelworks. I could hear bikes and the roaring of sand buggies. As always with dunes, the paths are confusing and I found myself on a track high over the main path, so was obliged to slide down a fairly steep slope to join the path. I crossed the M4 and headed towards the wood surrounding Margam Abbey ruins, which I reluctantly decided not to investigate as time was marching on. I stopped to empty sand from my boots before entering the wood and had a chat with man clearing rubbish who told me there would be a mass on hill on Wednesday 23rd July, commemorating two Catholics hanged, drawn and quartered for hearing the Mass – dobbed in by their brother…nice. Entering the word, it was difficult to see the path. But I climbed up steeply until I found it running east west. It was fairly clear and soon became well marked. Eventually, it was broad and gravelled. It turned sharply down, which was a surprise, but I followed it, relieved to see another west leading path branching off. This was also gravelled, but after some 300 yards simply stopped. I carried on, over difficult woodland, thinking I would find a clearer track, but it got worse and worse. I could hear motorway to my left, but there was no track, the terrain was very steep, there were broken branches everywhere. I kept trying to move west. According to map there were two well marked paths, but I could not find either. Since I was near the motorway, I tried to climb north, reasoning that I must hit one of them, but it was much too steep. all I could do was inch west. I am covered in cuts from the brambles, and the splintered wood. I can only be glad it has been so dry. There were lots of mossy rocks probably, normally slippery as glass. I began to feel very worried. If I slipped, no one would hear me or see me. I saw a bit of plastic, which I hoped meant occasional visitors who might find my bones and give them decent burial. Eventually, I emerged, scratched, sweating, thirsty and filthy. This was followed by a long stretch along heathland, where the farmer had carefully locked all the gates. The path is very poorly signed. At one point, having marked straight on, it stopped abruptly at a barbed wire fence. I could see path on the map, and gate the opposite side, so I put map on barbs and scrambled over. This brought me into the back of Port Talbot and a dull walk through its back streets, before reaching the shore again at Baglan. This is another lovely beach, but then the path turns up the Nedd estuary, into Castell Nedd/Neath. I was pretty exhausted by this time, but there was still a further three miles or so back to the carpark in Abertawe, mainly by the side of the A48. In theory, it was supposed to be 19 miles, but with all of the wanderings and ins and outs, it was nearly 22. Sunday having fairly limited public transport options, Jane and I had to be at Ogmore to catch the single bus that would take us back to St Donat’s. With my usual need to be everywhere early, we had a good half hour to wait at a place where no bus stop is actually signposted, but where a local farmer assured us it did stop – usually. After about 15 minutes, a car stopped and we were given a lift a few miles into Ogmore-by-Sea where there was at least an official bus-stop and a lady standing by it looking expectant. Local knowledge proved correct, and the bus did turn up, carrying us through the tiny lanes to the point where I finished yesterday by 12pm. The forecast was not good, and it rained off and on, although not heavily, most of the day. Ther e was the odd burst of sunshine over the sea, which sparkled silver. The path dropped down to the sea, and up again to the cliffs from time to time. The mud was knee-deep, and it didn’t take long for me to slip – sitting down hard in a bramble patch. The rest of the day, I trailed mud everywhere. After about an hour, we passed the lighthouse at Nash Point, and shortly after came to the Nash Point carpark café where I had an excellent bacon roll, and Jane had Victoria sandwich – highly recommended spot! By and large, the walk was flat, with one or two steep drops down – the greasy ground made it hard going downhill, and my knee is now giving gyp. I hope it will be better tomorrow – if it is not, I shan’t walk. For the first time more-or-less, since crossing the Severn, the Devon shore was occasionally visible – I could pick out the notch which is Porlock and I think at one point, I could spot Minehead. The coast is beautiful – very steep, vertical cliffs, with visible horizontal sediment structure in the land. This ability to see the history of the coast’s development make it a Site of Special Scientific Interest (SSSI), known as the Monknash Coast. It is quite unstable, and in many places the land has clearly sheered away suddenly – fence posts hanging over the sea. One of the prettiest parts of the path was the wooded valley on the approach to Dunraven Castle – sessile oaks, with an understory of bluebells – only a few were in bloom, but it will be a delight in a couple of weeks. There was sweet woodruff and ramsons, too, that Jane picked. We passed the foundations of Dunraven Castle, built in the 12th century on an old iron-age fort. It was raining quite hard at that point, which continued for about twenty minutes as we came to Aberogwr and turned up the river-valley. 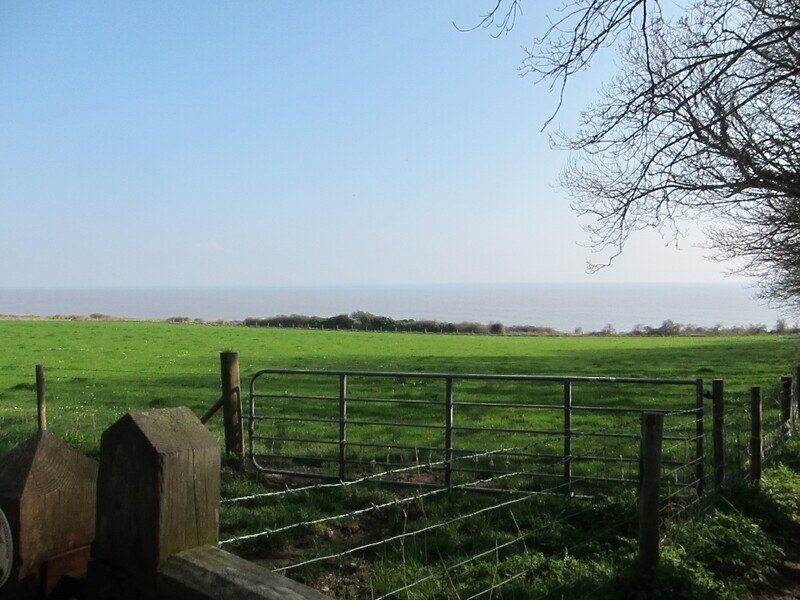 The views from the houses which overlook the estuary must be fabulous, when the sun shines. As we walked up the river valley back to Ogmore, the sun came out, even though it was still raining, and we saw a lovely rainbow. An average supper (although the service was very pleasant) in a pub and then a drive back to Bristol in absolutely torrential rain. Jane pointed out that it would stop as soon as we crossed the bridge into England, and, aggravatingly, she was right. Another silver day, with 9.5 miles covered. Last night was rather disturbed – the fire alarm for the whole block went off at 2.17am. I grabbed my coat, my slippers, my phone and my keys, as well as the keys to the flat (Jane had stayed somewhere else last night) and spent a few minutes standing in the street, looking like an extra from a bad soap opera – furry slippers, waterproof and nightie: all I needed was curlers. This exciting incident meant I woke late, but it did not matter too much, as there was little traffic this morning, driving back to Barry. The downside was the thick fog – visibility was not much more than 100 yards. 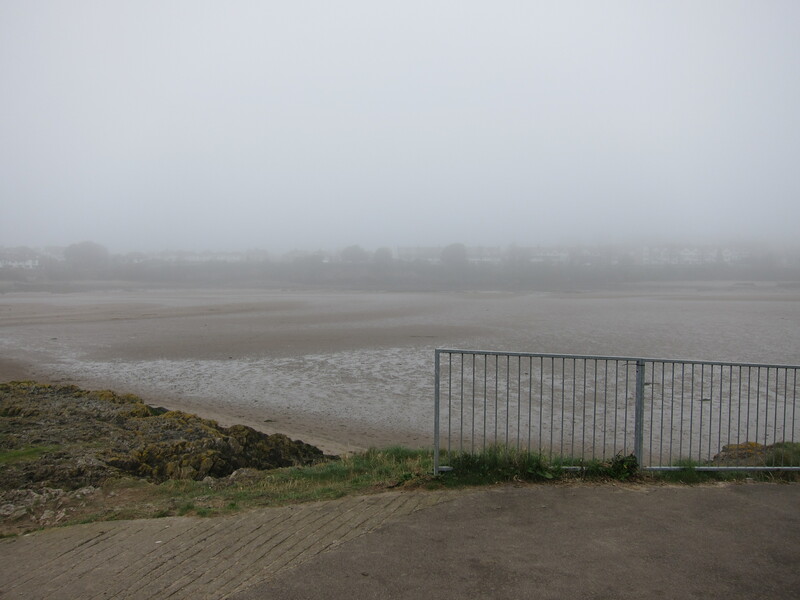 I drove over the spit to Barry Island, figuring I could ignore the half-mile from the bus-stop I finished near yesterday. Unfortunately, the layout of the roads has changed considerably from my map, with the construction of vast new housing developments. With that and the fog, (not forgetting the poor sign-posting) I got completely disoriented. Eventually, I sorted myself out, and came to the top of the island, a place called Nell’s Point. Of course, it is not really an island, just a promontory, joined with a thin spit of land. It was still very foggy – but as I walked down the west side, it became possible to distinguish between the sea and the sky, although only because of the wave movement. Barry beach is beautiful – so far as I could tell – long, wide, flat golden sands. It was somewhat disfigured by the noisy slot machine arcade blaring bad music place at the end – but, of course, everyone has different tastes. I was happy with the Cadawaldrs next door, where I was able to buy an excellent coffee. As I returned towards the spit, I saw that the tide was way out, so was able to walk across the harbour, rather than going back to the bridge – it was a bit of a scramble down, and the sand was heavy, but it made up the time I had lost. I walked around The Knap, another promontory, then climbed up onto the cliffs. Behind me, I could hear two women chatting. Eventually, I entered a wood, and waited so that I could ask them to take a photo. We got chatting – they are walking the Welsh Coast Path, but, like me, not all at once. One has a son with realistic ambitions to play rugby for Wales (Yay!!) and the other has a daughter who is a contestant in the Miss Wales contest. We walked together for a good half hour, and it was lovely to make new friends. Gradually, the cloud cleared and the sun came out, although it was not till the very end of the day that the Devon shore was vaguely visible . The path runs along the coast, occasionally climbing up and down, with a couple of places where I had to clamber over cobbled beach. 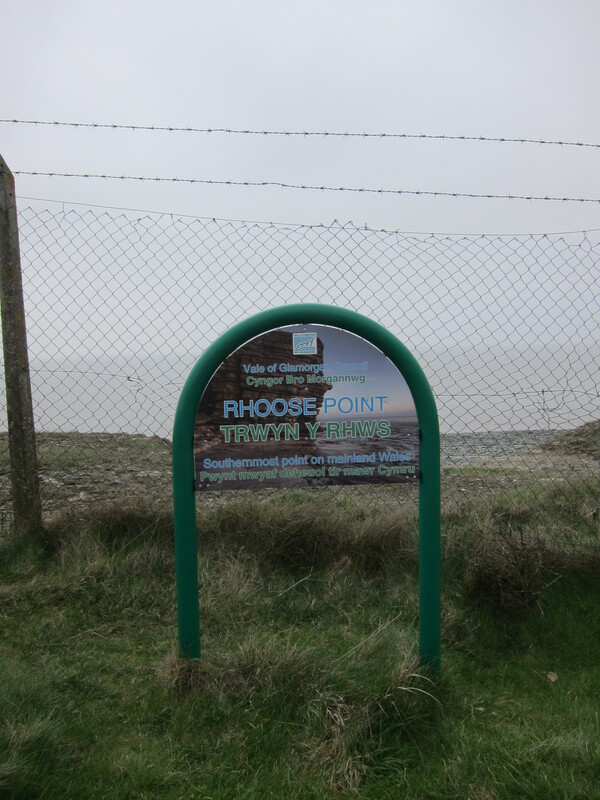 passed the southern-most tip of Wales at Rhoose Point, and saw some interesting geological features. The path passes a very large and ugly power station, where I was concerned that I was on the wrong side of the fence as the path was several inches deep in water at one point. I hopped over the fence, but soon had to climb back as there were private property signs liberally scattered. The path went inland for a bit, over fields, before dropping down to another cobble beach below Llanilltud Fawr. The evening sun was shining by now and the sea looked rather inviting. I realised that if I moved swiftly, I would catch the 17.12 bus at St Donat’s – I hurried too much, and saw the 16.12 bus chugging away, and had to wait nearly an hour. St Donat’s is the location of the Atlantic College – it is a delightful little hamlet. Meeting new people has turned this day into Silver.